Members of the Marion County community and USDA Rural Development representatives pose with Linda Carlson (above) and Teresa Huffman (below) as they receive their USDA grant checks. Relatively new Marion County Economic Development Director Teresa Huffman?s initial efforts were recognized at a County Commission payday meeting Thursday with receipt of $40,000 in grant money for county revolving account business loans from USDA Rural Development representatives. But she was somewhat ?topped? by the efforts of an individual business woman, Linda Carlson of Carlson?s Grocery in Marion. The same half-dozen Rural Development representatives left the Commission meeting to present the grocery $83,036 in energy efficiency grant money from a grant Carlson wrote herself. ABOVE: Marilyn Bartel, pictured with daughter Amy, purchases peanut-butter twists from Kathy Jantz of Durham at Thursday?s Farmer?s Market in Hillsboro. BELOW: Visitors to the Farmers? Market enjoy a chicken dinner outside the historic outside the Schaeffler House at Jefferson and Grand. In the first century B.C.E. a Roman named Pubilius Syrus wrote that ?everything is worth what it?s purchaser will pay for it.? To Hillsboro citizen Joni Calam, some things are worth more. Entering the third week of its second season in Hillsboro, the farmer?s market of course continues to match buyers to sellers. But to Calam, one half of a tandem of sisters who volunteered to start it a year ago, the market is more than a place to buy and sell; it is a place for a community to come together. Marion County businesses receive KDOC merit awards. Summer is just around the corner and the new co-managers at the Hillsboro Family Aquatic Center are gearing up for some fun in the sun. At the end of April, the city of Hillsboro hired Judy Helmer and Marci Cain as co-managers, succeeding Jodi Stutzman. The mother-daughter tandem is familiar to many Marion County residents. Barber Randy Wiens takes some light-hearted guff from Jim Peters, one of his 700 customers, about taking ?too much off the top? during a recent haircut appointment. Wiens is celebrating 25 years of service in Hillsboro on Friday and Saturday.Don Ratzlaff / Free Press. Click image to enlarge. To celebrate his quarter-century of cutting hair in HIllsboro, Randy Wiens is planning an open house at Silver Shears during his Friday and Saturday hours. He is offering refreshments, gifts, door prizes and a drawing for $25 in haircuts. Randy Wiens jokes that he?s still trying to figure out what to do with his life. In the meantime, he?ll keep barbering. This Saturday, Wiens will be celebrating 25 years of cutting hair in Hillsboro at his Silver Shears shop on Main Street. ?I was going to go to Hutch Juco when I graduated from Inman High, but I didn?t know why,? he said about his career choice. 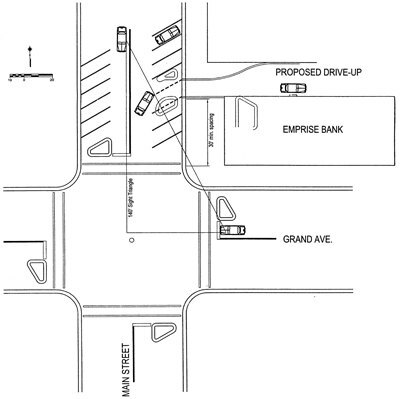 Traffic study plan for emprise bank drive-through. Click image to enlarge. Emprise Bank received approval last Tuesday from the Hillsboro City Council to proceed with a revised plan for constructing a new drive-through lane at its Main and Grand location. In late November, the council denied an initial proposal from the bank, even though the plan had been recommended for approval by the city?s Planning Commission.